Since Microsoft launched Windows 7 back in 2009 a lot has changed. Apple`s introduction of the iPad just a few months later has resulted in a tablet revolution, with traditional laptops now being eschewed in favour of slate-like devices by many consumers. The answer to this issue lies in Windows 8, Microsoft`s next major operating system. It is designed to be scalable enough to power both high end desktop computers as well as tablet devices, so it should be more flexible than Apple`s iOS while still being just as user friendly when used on a touchscreen gadget. Expectations are high for Windows 8 and Microsoft will be looking to deliver a revolutionary new software package which retains the best aspects of its traditional platforms while integrating cutting edge features which will allow it to flourish on a tablet form factor. 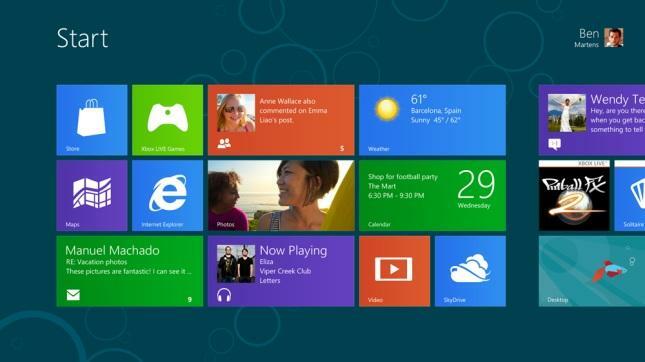 The first tablet-friendly feature which Windows 8 will have is an overhauled interface. While you will be able to view the traditional desktop setup if you wish, Microsoft has taken the Metro UI from its Windows Phone mobile operating system and brushed it up to work on larger, higher resolution displays. The Metro UI assigns apps and shortcuts to tiles, which can be updated in real time with information pulled down to the device via a network connection. The large, bold design is easy to interact with using only your fingers, so there will be no need for a keyboard and mouse to make the most out of Windows 8. You can add apps and services to a Windows 8 tablet via the Windows Store, which will be a way to get first party and third party software onto the device without having to use physical discs or independent download platforms. Because Windows 8 will be functional on tablets it needs to have a solid context sensitive keypad. Microsoft has given users the option to resize the onscreen QWERTY keyboard to their liking and the keys can be arranged on either side of the screen when the device is held in a landscape orientation. This will make it easier to type using your thumbs, with a numeric keypad taking up the middle portion of the display. Deep integration of Xbox Live is promised on Windows 8, which will make it easier to find out what friends are up to, earn achievements and GamerScore while playing titles and even download the latest releases direct to your tablet. Xbox Live has been a real success on Windows Phone and so Microsoft should have no trouble replicating this functionality on a tablet with Windows 8. While rival platforms have similar services, none are quite as well integrated as Xbox Live. Windows 8 will be built to handle location-based services since most tablets will feature GPS onboard. This will echo the way a smartphone deals with mapping, geotagging and a host of other functions. In all Microsoft looks poised to make a compelling case for Windows 8 when it gets a full release later in the year.